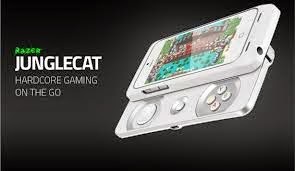 Razer has recently announced its latest gaming juggernaut, Junglecat gamepad for iPhone. The Junglecat works with iPhone 5 or 5S. The Junglecat features a slider that can in or out the gamepad. It has four pressure-sensitive buttons, D-pad, and set of bumpers. With Junglecat Gamepad, users will not have to detach it from their iPhones as all the phone’s buttons and ports have been translated on to the Junglecat. It is only 20mm thick so easily pocketable. Junglecat is a certified MFi product that means it can be used with the latest upcoming Apple products. One of these features has Game Controller Forwarding which lets Junglecat to be used as a controller for big screen iPhone. The Junglecat is packed with downloadable iOS app where users can customize all of the controller’s buttons and can adjust their pressure sensitivity. Users can save up to 20 profiles and let them save different control settings for each and every games. To support Junglecat users, the iOS app also recommends titles from the Apple Store that are optimized for playing with a controller.